t’s not easy researching a name like William WILLIAMS. Fortunately, my mother kept fabulous scrapbooks about her maternal Welsh ancestors. Here is a picture of William WILLIAMS and his wife, Jane OWEN, my great grandparents. This family arrived at Castle Garden on 16 April 1883. There were two other males, John and Roland, with the surname Williams who arrived on that date on the ship Spain. Currently, I have no Roland Williams in my family tree. That is a name that needs to be investigated. William WILLIAMS had an older brother John, and that could possibly be his brother. John’s age is listed at 39, whereas William is 27. My records indicate that John was only three years older than William. Also, the Castle Garden entry states that John was born in England. (2) Williams is a common name so these other men by the name of Williams could possibly be strangers. William Williams was a laborer. He was on a ship named Spain. He arrived on 16 Apr 1883. The ship departed from Liverpool and Queenstown. He paid for his own trip. He was destined for the United States. (1) CastleGarden.org: America's First Immigration Center, search results for "Williams," "Spain," and "1883" (http://www.castlegarden.org: accessed April 21, 2013). 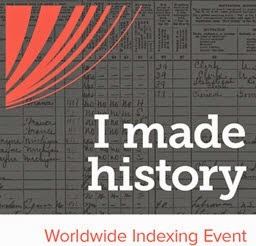 (2) CastleGarden.org: America's First Immigration Center, untitled database (http://www.catlegarden.org: accessed April 21, 2012), entry for John Williams, age 39, arrived 16 Apr 1883 aboard the Spain. (3) CastleGarden.org: America's First Immigration Center, untitled database (http://www.castlegarden.org: accessed April 21, 2013), entry for William Williams, age 27, arrived 16 Apr 1883 aboard the Spain. 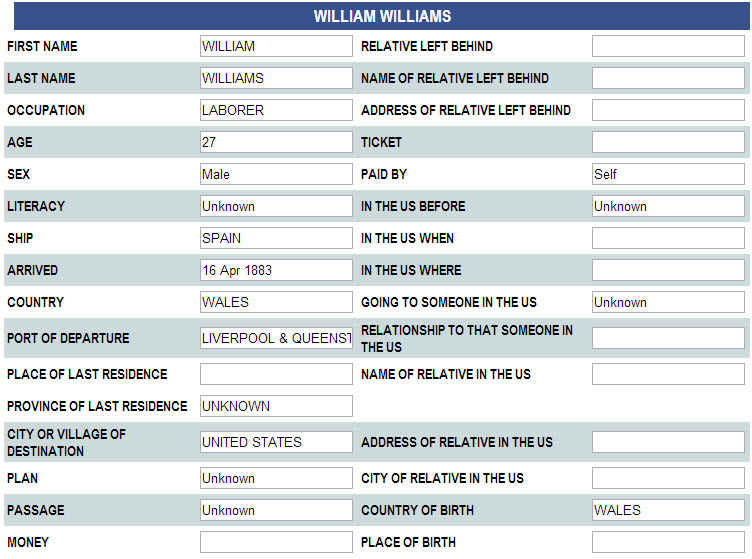 (4) "New York Passenger Lists, 1820-1957," database, Ancestry.com (http://ancestry.com: accessed April 21, 2013), entry for William Williams, aboard Spain, Liverpool, England and Queenstown, Ireland to the United States, arriving 16 Apr 1883, citing Passenger Lists of Vessels Arriving at New York, 1820-1897; (National Archives Microfilm Publication M237, 675 rolls); Records of the U.S. Customs Service, Record Group 36; National Archives, Washington, D.C.
(5) Sharon DeBartolo Carmack, Genealogy at a Glance: Immigration Research, (Baltimore, Maryland: Genealogical Publishing Company, 2011), 3.